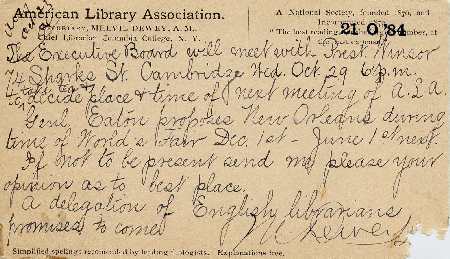 The postal card below was mailed on October 21, 1884 by Melvil Dewey in his capacity as Secretary of the American Library Association to Ainsworth Spofford who was the Librarian of Congress and a member of the Executive Board of ALA. Although the card is in poor shape it provides an interesting glimpse into our library heritage. 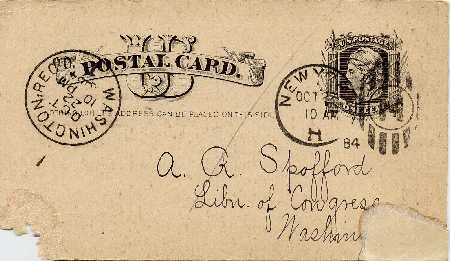 The postmarks on this card indicates that it left the New York City post office at 10 am on October 22, 1884 and arrived at the post office in Washington, DC at 10 pm on October 22, 1884. The postal card is the issue of 1881 and is one of 1,301,000,000 cards of this type issued by the U.S. Post Office Department. The card was evidently pasted into a scrapbook and further damaged when it was removed. At the time the card was mailed, Dewey was the Chief Librarian at Columbia College. A pre-printed message on the card indicates that ALA is a national society founded in 1876 and incorporated in 1879. It also includes ALA's motto "The best reading, for the largest number, at the least expense." Melvil Dewey was a proponent of simplified spelling and managed to place a pre-printed promo for that endeavor on the card. The post office printed these cards in sheets of 40. Organizations and businesses could then have private messages pre-printed before they were cut apart and used individually.